Original Review, July, 2008: This is a work-in-progress from the Chez Ray 2006 vintage. Old Hill Glenn Ellen cabernet sauvignon is from Sonoma Valley. In the glass, it is medium red, velvety color. Aromas are deep fruity, with an almost stinging alcohol "zing", touched by some charcoal oak. Just from the aroma, seems like it needs time to settle down. On the palate, you get a bold-but-light-touch, mid-palate attack of sweet, bright, alcoholic fruit. 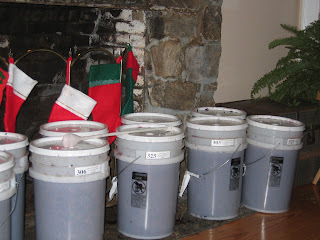 Wow - unlike any cabernet sauvignon you've probably experienced - likely because of the unusual fermentation technique (pictured here). Think the easiness of merlot with the body and aromatic style of a pinot noir. I'll give this three stars out of five on the Spirit of Wine scale for now (that seems to be becoming somewhat consistent for the 2006 vintage). But this one has real appeal for the future - so keep watch! Updated Review, two years later, September, 2010: Color is consistent, now just a hint of pale brick at edges. Fruity with stewed strawberries on the nose, no "zing". The palate is remarkably consistent over the intervening two years - soft red currant flavors coming through on the finish. Still a lighter, more aromatic style than I am accustomed to in cabernet sauvignon. Leave at three stars, though now I'm not so convinced this will move to dramatically better places with more years. Updated review, another year later, September, 2011, now five years from vintage date: Consistent color. Soft berries and hint of strawberry on the nose. Soft red berries on the palate, nicely knitted. The balance of aromatics, soft red berries, and lightly tannic finish brings this to a full four stars at five years from vintage date. This says a lot for the Assmanshausan yeast and cooler fermentation protocol. Following long decant, full day kept cool in partially filled bottle: Soft, very light red fruit and plums on the nose. Soft and full on the palate. This absorbed the air nicely. Updated review, another two years later, now seven years from vintage date, October, 2013: Medium red and light orange throughout. Still soft strawberries and red berries on the nose. Bright and lightly aromatic sip, with a clean, swift, bright finish. Held nicely to age.